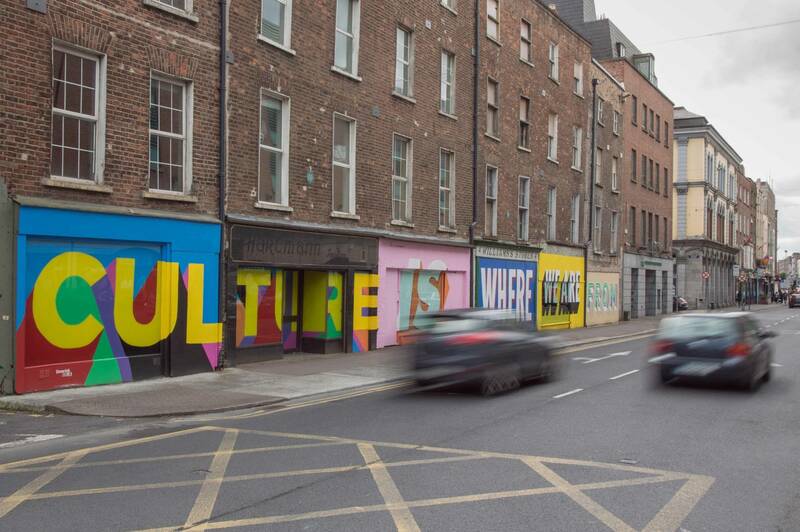 Probably one of the biggest painting projects in Ireland this year, in terms of scale, visibility and costs was in the form of a cultural branding project in Limerick City, as part of their European city of culture bid. More so than it’s competitor cities Galway and The Three Sisters, The Limerick 2020 team invested a significant amount of resources and energies into its branding. The paint the town project was rolled out in the lead up to the final round of judging. For it, murals and banners of Limerick 2020 slogans and logos were, what seemed to be, sprawled across every available facade in the city, just in time for the visit from the judges. You would imagine the judges at first sight may have been led to believe, that these murals were the result of initiatives similar in spirit to the community mural movement in the United States in the 60s and 70s, or the community mural projects in Belfast in the late 70s and early 80s. In Alan Barnetts Community Murals: The Peoples Art, he argues that such movements come out of three factors, “A yearning of artists for roots,….. of working people for a means of expression…..and of communities for control over their own existance”. Sadly the Limerick 2020 murals did not derive from any of those elements. The language of choice for the project was an urban or street art aesthetic, as if to suggest the murals were the labour, voice and expression of a vibrant Limerick youth culture. Instead, and the clue is in the formalised language of typeface and slogans which come from the design and branding worlds, the murals were produced by Piquint Media, the media and design company behind the identity for Limerick 2020, on behalf of the bid team. Painting is inextricably linked and dependant on a relationship to the urban environment. Most artists work from towns and cities, and it is also where you find nearly all galleries. The troubling point about a city body like Limerick 2020 commissioning murals by design companies to posture as artistic activity, is that it undermines investment into actual artistic production, instead favouring a simulant. To favour a simulant on economic grounds would be one thing, but the sheer scale of The paint the town project suggests it was a costly process, which also undermines the confidence the city body had in the value and quality of local practice. As if to say who needs artists to create cultural produce, when you can outsource the look of it, custom made to fit your agenda. As a gesture this is not good for artists, and such attitudes are not exclusive to this particular case. Town, city and government bodies nationwide show little enthusiasm to support cultural activities and infrastructure, either through finance or endorsement. Funding to the arts and its infrastructure has been severely cut in the years since the boom. Ireland spends 0.1% of GDP on culture, compared to a European average of 0.6%. Even with artist project and bursary funding available, the current models of application criteria for such awards are based and assessed on an artist’s creative and budgetary project projections. The improvised nature of many painting practices, make it difficult for those artists working in the medium to make such creative forecasts, thus putting them at a disadvantage. But it is in the waning desire of city and government bodies nationwide, to develop and support artistic infrastructure that is most damaging to painting practices. The property rental market in cities and towns all over Ireland is increasing at astonishing rates. With rising rents, it is becoming increasingly difficult for artists to financially afford to continue their practices and gain platforms for visibility. For painters, this is particularly crucial, painting is fundamentally and historically tied to the concept of property. It’s default form is interior in nature, worked out of a studio, displayed in a gallery, and subject to good fortune sold to a home or museum. Because of the dependency painting practices have on such spaces, recent governance and economic processes threaten those very relationships in cities across Ireland. In Dublin, estimates suggest 50 per cent of studio and artist spaces have closed down in the past two years, an advancing pattern throughout the Republic’s other cities. Apart from the issue of the lack of affordable work-spaces, available living space for artists is at huge risk too. As the property market spirals out of control, it creates the wider social problems of increased evictions and homelessness. A Visual Artist Ireland 2016 report The social economic and fiscal status of the visual artist in Ireland 2016, shows that 76 per cent of visual artists in Ireland live under the poverty line. This makes them one of the most vulnerable sections of society at risk to eviction and homelessness. The report also shows that that 76 per cent are only earning less than €10,000 per annum, from creative AND non-creative work. The Irish Living Wage Technical Groups 2016 calculation for a gross salary, that would provide the minimum socially acceptable standard of living in Dublin is €27,553.38 and in other cities is €21,046.31 per year. If 76 per cent of artists are earning under half that, the potential for ongoing relationships between artists and urban environments is unsustainable, and more so for practices like painting, that are also subject to workspace costs. When Ireland’s Taoiseach Enda Kenny proposed that,“Ireland can become the best small country in the world in which to do business by 2016 (Kenny,2011)”, he started a narrative the government continue to sell on the world stage. Ireland the best small country to do business, a country rebuilt, a nation restored, is the image proudly pronounced to the world, while political leadership privately undermines its citizens through low investment and support for their most basic of needs, shelter! At the same time cities compete with each other for outside cultural investment, for tourists, for business. They propose to have sound qualities of life, and standards of living, encapsulated through relationships to history, heritage and culture, while privately they undermine and undervalue the activity and livelihoods of those responsible for creating such produce. The outsourced murals in Limerick say ‘Limerick is the best small city to do culture in’. Sadly the reality is, it is becoming increasingly difficult to do culture in it, or in any other Irish city for that matter, especially if you’re kind of culture requires space. New image technologies are not the biggest threat to painting, instead they come from painting’s weakening relationship to urban environments, through economic and political processes. One of the great themes in painting is the urban one. As a subject urban life and interests were the forces that fired the dynamics of the modernist painting enterprise, right through to contemporary times. Those subjects are responsible for everything, from the Impressionist’s depictions of bourgeois Paris, to Basquiat, Bacon, and in the present period, the output of artists like Julie Mehretu, Kerry James Marshall and George Shaw. Although not as widespread a subject in Irish painting compared to rugged landscapes, during the 20th century artists like Jack B Yeats and Colin Middleton produced some key works. In Irish painting today, urban dynamics have manifested themselves in a range of painterly practices. Kathy Tynan, All of Old, 2015. “Usually it’s something quite ordinary, but for whatever reason in the moment, has made itself seem extraordinary for me.”(Kathy Tynan,2016). In Yeats’s small collection of paintings that feature Dublin, the built environment of the city is cast as the theatrical backdrop for the events and lives of its inhabitants. Tynan mostly re-casts this built environment in the front and centre of many of her paintings. The events and lives of Dubliners are still represented, but are disclosed through the surface quality of their locale, the existing painted fabric. The emulsion, bricks, mortar and cement in Tynan’s surrounding area, are in painterly terms the ground of her urban environment. The urban painting is a collaborative project and aesthetic, composed by many and always in flux. Stilling and framing parts of this through her own shorthand language, reminds us that the environments we live in have a materiality to them. A materiality that represents the social, political, economical and cultural residue of sites. To engage with Tynan’s paintings, through formal and conceptual responses to their surfaces, painterly language and composition, incites we examine our own worlds under the same terms. This re-orientation of site through painterly repositioning, is at once a familiar and bold attempt by Tynan to offer us new ways to see our world. It proposes that we all take the opportunity to seek out new vantage points, a proposition at the core of painting practice from its earliest days. Merging the concepts of documentation and artistic output was at the centre of the invention of painterly perspective. Painterly perspective was never just a device to enable us to show what was seen, by translating the three-dimensional world into two on the canvas. It was also and perhaps more importantly a tool that could introspectively skew and reshape what we see, by reciprocally allowing us to re-organise our experiences of the real world through our engagement with paintings. Public and social contexts can be viewed in their most concentrated states, through urban dynamics. Empireland, by the artist Mark O Kelly, was a work and exhibition recently on display at Project Arts Centre in Dublin. Project Arts Centre commissioned the work in response to the centenary of 1916. It is a huge 280×900 cm work, painted on a motorway gantry sign and is installed off the wall, standing in the centre of the gallery space. The work developed out of a conversation between the artist and exhibition curator Tessa Giblin about creating a public artwork. The depicted subjects, images and signs montaged together in Empireland, are very much embedded in public, social and urban narratives. Architecture, protest, public space, concepts of democracy and citizenship are represented in the montage of images. Painted are; a photograph of the 1983 Dunnes Stores supermarket worker protesters on their return from South Africa, The Crystal Palace (a structure originally built in Hyde Park, London, to house the Great Exhibition of 1851), details from the Renaissance artist Lorenzetti’s painting Allegory of Good and Bad Government, a Sigmor Polke painting of Dublin, and floor plans of Charles de Gaul airpot in Paris. This structure of images is overlaid with various signs, symbols and logos. Signs and logos for Alfa romeo, Panadol, Pure-wool, and other symbols take their place as stakeholders in O’Kelly’s image of a public sphere. For O’Kelly these types of systems of information being gathered and distributed are central to the idea of what a public sphere is. His approach, to collage and overlay various images, signs and gestures together in a single work, is a way to simulate this through painterly means. If a ‘public’ is the sum of any number of elements, Empireland also simulates this infra-structurally speaking. As well as being an amalgamation of images and signs, Empireland is also and amalgamation of materials. 10 individual steel sheets, 10 iron bars, countless number of screws and bolts make up the work. The sum of it’s parts are on show, and not hidden as is usually the case in paintings. You can walk behind the painting, and view its structure from every angle. Each element, from the smallest screw to the large sheets of steel are in a network of relations with each other. Each, a structure in its own right but part of an infrastructure. The painterly languages illustrate a similar network of relations. The painted image is the sum of hundreds of cross hatched lines, marks and numerous forms, colours etc, each individual element, a painterly constituent of the whole image. The wide format of the painting and its sign like structure suggests it is an object to be read. As a viewer you scroll across it, left to right and around again. It directs you through a formal device shaped much like a roadway. It navigates the viewer in a way that is similar to the concept of a public tour. The narrative on this tour, like the narrative of any public or urban space, is a journey through history, politics, events and architecture. Ballygrennan Close community art project, 2010. This last work wouldn’t normally be considered as part of the wider contemporary Irish painting canon. I would however have it as part of mine. It takes the form of a community art project to cover up the run down and damaged faces of disused premises in the Ballygrennan close area of Moyross in Limerick. Moyross estate is a local authority social housing development on the northside of Limerick City, built during the 70s and 80s. From the outset, Moyross was poorly planned and built with no infrastructure to cater for the size of the population. Like many greenfield social housing developments in Ireland at the time, the lack of infrastructure, and high levels of unemployment led to extreme levels of poverty and disadvantage that continue to the present day. Ballygrennan Close is one of the more recent developments of the estate, built as a regeneration project and completed in 1999. Unfortunately, some of these newer housing units in Ballygrennan Close soon fell into disrepair and abandonment. This was due to the perpetuating social and economic conditions of the area, and compounded by the stalling of the wider regeneration plans for Moyross during the recession. The community art project led by designer and maker Tara Whelan was tasked with enlivening the boarded up, run down and damaged faces of the empty Ballygrennan housing units. The witty concept was to paint scenes of occupancy on the boarded doors and windows of the houses. Stylised Representations of new doors and windows were painted on the boards. Depicted also are residents who happily go about their daily lives, gazing out the window, seemingly cheering on a rugby match on TV, leaving for work etc. From it’s description it sounds like the form any standard community art project could potentially take, nothing noteworthy it would seem to justify it within the remit of painting discourse. But it does seem to have a convergence of elements that may give allowances for such a reading. Paint is a tool to touch up, cover unwanted sights, and to clean. Those uses of it, in the context of this project, to present to us the image of a functioning community, in place of something else, is at best cliche and at worse menacing. This is painterly regeneration in some warped and explicit sense, and can be read as a critical engagement of regeneration processes. The overlaying of the fictional clean, stylised, animated and cheerful languages of the boards, against a muted real backdrop of fragmentation and stagnation, creates a surreal tension both aesthetically and thematically. These sort of tensions come about as a result of the project having to incorporate and grapple with a plethora of complexities; local peculiarities, cultural narratives, social issues, community interests, concepts of community, and painterly languages. The efforts in my opinion, absorb and refract the confusion of those complexities and thus precisely represents aspects of the physical and psychological landscape of that world, as much as any other form of painting or art might. According to the 2012 census, 66 per cent of Irish people live in its cities or suburbs. Artists like Kathy Tynan, Mark O Kelly, and projects like the one led by Tara Whelan, represent aspects of those urban worlds in painting. Painting proposes ‘slow looking’. It has the potential to decelerate how we engage with the fast paced urban world. This makes it one of the great subjects in painting. Given the precarious conditions for painters working in Irish cities today, unless those conditions change it is hard to imagine in the future artists will be able to sustain that working and creative relationships to cities. In that case, inevitably a tradition of painterly engagement with the Irish urban site will decline, leaving the majority of the population without much representation of their world through the medium.